The recent celebration of the 68th anniversary of International Human Rights Day by the state government and the Ombudsman’s office is to be applauded. For inherent in human rights is the dignity, rights, and freedom of every human being. This vitally important Declaration set precedence for the rights of indigenous peoples. It became the basis for the UN Declaration on the Rights of Indigenous Peoples in 2007 in which Samoa initially abstained while New Zealand, Australia, Canada and the USA voted against. Though those votes since have been to various degrees changed in favor. While Human Rights Day celebration marks the launching of a national inquiry into Family Violence, it also presents us, tagata Samoa, with an opportunity to reflect on the state of our own human rights as indigenous people and host culture. Considering the unprecedented level and nature of violence, the increasingly changing demographics in Samoan society and the direction in which we are heading as an indigenous people, reflection (tofa saili) on our past, an integral part of our indigenous search for wisdom, may help us find a less violent and more harmonious path moving forward. To understand our present, as an indigenous people and as a sovereign indigenous nation, we have to look into our past in terms of our relationship with foreign interests. Douglas Oliver was referring to non-islanders’ (papalagi) search inspired by faster trade routes to Asia and a vision of a world where a man actually co-existed with nature in perfect harmony. According to former East-West Center professor Robert Kiest, in his paper, “Impact and Images,” of colonization in the Pacific Islands, the papalagi eventually found their dream world in Tahiti, Samoa, Rarotonga, and Tonga. The Pacific Islands, our ancestral home, no sooner became a colonized playground to foreign interests, was dubbed, “Paradise.” This notion has been often reinforced by such romanticized labels as South Pacific and South Seas in succeeding years. But the papalagi did more than co-exist with our ancestors, as Oliver points out, they wanted our ancestors, (tagata Samoa) to be like them (papalagi). In spite of the alofa and much hospitality extended to them, papalagi still maintained, our ancestors were less of human beings, uncivilized, “noble savages” and to a large extent a burden upon which they, only they, (the white man) have the divine and moral obligation to transform and civilize. This was the primary purpose of Christian missionary work since the arrival of Christianity in 1830. It was a transformation deeply rooted in the violence of RACISM. It was mandated by Pope Alexander VI in the Doctrine of Christian Discovery in 1493. The Bull stated that any land not inhabited by Christians was available to be “discovered,” claimed, and exploited by Christian rulers and declared that “the Catholic faith and the Christian religion be exalted and be everywhere increased and spread, that the health of souls be cared for and those barbarous nations be overthrown and brought to the faith itself. This explains why and how the three mainstream churches in Samoa, the Catholic, Methodist and Congregational Christian Church of Samoa have become the largest land owners in the islands. Christian churches and state government were and still remain the chief protagonists in this drama of colonization. Although Samoa was declared politically independent in 1962, the papalagi had left behind an institutional structure in which our current system of governance is firmly embedded. This institutional structure is dominated, tightly ruled and controlled by the state government and Christian churches. Both by design were invented specifically to serve foreign interests at the devastating cost to indigenous tagata Samoa. Foreign interests and his twin brother foreign investors are direct descendants of Christianity. They are diseases of colonization that have to be cured if not tamed in order for the indigenous poor and marginalized to have peace. 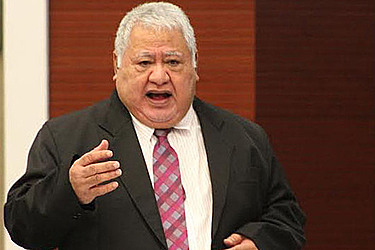 In a cultural sense, P.M. Tuilaepa and his current ruling party, the HRPP, which has controlled Samoa since the 1980s, is an extension of New Zealand colonial rule. This is the genesis of the current power structure in which tagata Samoa, citizens of the indigenous government of Tumua ma Pule, Ituau ma Alataua, Aiga i le Tai ma le Vaa o Fonoti, are subjected. The difference between us today and our ancestors in my view is integrity. The continued silence of Tumua and Pule, our indigenous leaders, in the face of PM Tuilaepa’s relentless assault on our indigenous rights, speaks to the overwhelming success of state government in the oppression, with surgical precision, of indigenous tagata Samoa, though the pain might be far more acute with the poor and marginalized. We look into our past and will find that our ancestors were very actively involved in the decision-making process. In spite of colonial oppression and violence, they were still able to summon the personal courage to find their voice. Their resilience and dignity had persevered in the face of lies of assimilation by Christian churches, and the violence of genocide by the state government, and deception by both in the dismantling of our cultural heritage. We, I’m convinced, can never find peace and joy in the militarized government arm of law and order or the constant legislation of new laws and deceptive dictates of foreign interests through state government and abusive demands of Christian churches. Instead, maintaining the va fealoa’i in our Samoan cultural heritage offers us genuine peace and joy in love (alofa), forgiveness (faamagalo) and humility (agamalu/loto maualalo), integrity (tausi mamalu) and reciprocity (osi aiga). These are divine indigenous Samoan values inherent in our indigenous rights as indigenous people. It is this divine that is inseparable from our humanity only when we find meaning in the daily practices of our cultural heritage.